Your collection of tickets, dumped out on the table. An interesting or evocative photograph (landscapes work great), printed in faded grayscale on white paper. I usually tinker with exposure/brightness and contrast until the photo is light grey but still sharp and clear. Each person doing the activity needs his/her own print-out (or choose different photos for different people). Look closely at the picture in front of you. You’ll notice that it is faded and colorless. That’s because you’re going to be filling it with colorful words. What details do you notice in this picture? If you were there, inside the scene of the picture, what would you see? What sounds would you hear? What scents would you smell? How would things feel if you touched them? What sort of mood, what feeling inside, do you get from looking at the picture? Is it peaceful or scary, happy or sad? Imagine this is the setting of a story. What sort of things might happen here? Look through your word tickets for words that fit your picture. Find the names of things you see. Find sounds and smells and textures. Find nouns, verbs, adjectives, colors, animals, shapes. Find things you imagine are in the picture even if you don’t see them (Is there a monkey hidden behind the tree, do you think? Is there a green alien inside that spaceship?) Find emotion words and idea words. You can even put words together into phrases: Spectacular sunset. Waterfall gushing. Purple noses. Cloud adventure. If you pick up a word ticket and think, “That word has nothing to do with my picture,” stop and think again. Maybe you haven’t looked at the picture closely enough yet. Maybe there is no spaceship in this forest, but there might be a stone near the river that is as smooth and shiny and round as a spaceship. Maybe there is no broccoli, but that tree sure looks like broccoli. Maybe there is no battle happening in your picture, but this might be exactly the sort of setting where a battle could happen. Gather a pile of word tickets near your picture. You should have at least 20-30 (the more the merrier!) before you move on to the next step. Step 3: “Paint” your picture. 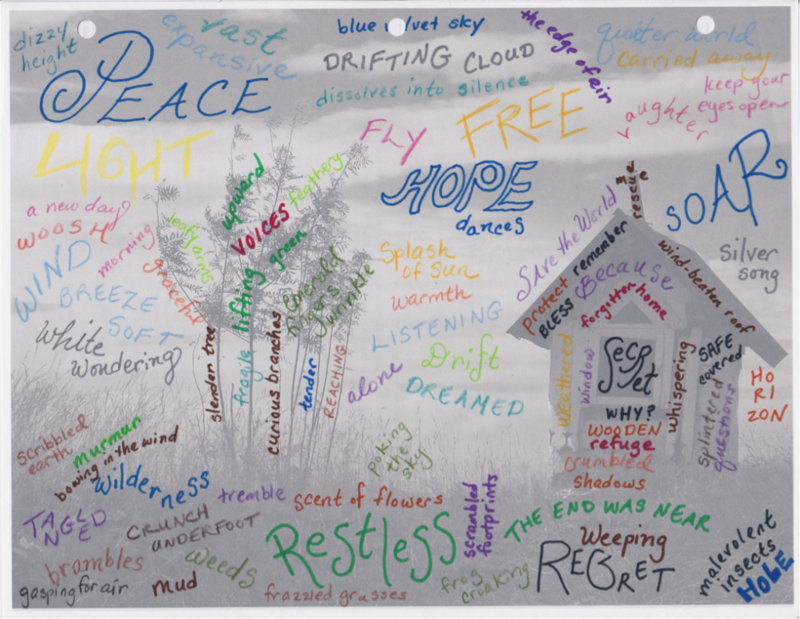 Why do you think I put words like “hope” and “peace” in the sky? Why did I put “fingers” and “arms” in the tree branches? Step 4: Turn your painting into writing. You could stop here and have a beautiful piece of word art, but this is a creative writing activity so let’s go on to the next step! Now that you’ve gathered words, staring at a blank piece of notebook paper won’t be nearly as scary. Use as many of these words as you can to write a description of this picture. For example, you could write . . .
A letter: Pretend this is a photograph you took on your recent vacation, and you’re trying to describe to your best friend exactly what it looked like and felt like to be there. Make your friend feel he or she is right there in that picture with you. A poem: Don’t worry about rhyming. In each line of the poem, write a phrase or sentence describing one thing about the picture, choosing two or three of the words you wrote there. The beginning of a story: Once upon a time, there was . . . what? where? Is an adventure about to begin in this place? Write the first page of a story, describing the setting inspired by your picture. It was peaceful the day I walked through the wilderness and found the little house of secrets. My heart was full of weeping and regret, for I had traveled a hard journey. The whoosh of the wind in the blue velvet sky made the tangled brambles murmur and the weeds tremble. As I walked along, I could hear the soft crunch of frazzled grasses under my feet and smell the sweet scent of flowers poking through the earth. A frog croaked in the mud. Other people had walked here before me and had left scrambled footprints in the dirt. Five slender trees reached upward. Their branches were like arms lifted towards the sunlight, and the leaves were like feathery emerald fingers. I thought I heard voices in the greenness. I could listen here alone and dream in a splash of sun. I felt my sorrows dissolve into silence. And then through the shadows I saw the little house: It was wooden and weathered, with a wind-beaten roof—a forgotten home whispering to me. I looked into the dark window: there were secrets inside. But I knew I would be safe there. It was a refuge, a place where all my splintered questions could be answered. I opened the door and went in. A ladder led up to the roof, and I climbed it. I stood on the little roof and said, “Rescue me!” And then—and then—can you guess what happened? I felt wings growing on my back, like the wings of a beautiful bird, and they lifted me into the sky. And I flew—up, up, up into a quiet world where there was laughter and a silver song, and where hope was dancing. I was free. Now it’s your turn. Happy word-painting! Special note: This activity is featured in my online writing class, “Playing with Words,” which begins August 24. For the next three weeks, Story Warren readers can use the coupon code RABBITS to get 15% off registration for this or any of my other online classes. For more information, see my website www.sleepinggiantclasses.com.